The evening was then turned over to Pastor Chris Holck who revealed plans and drawings for the next and final phase on the Woodridge campus which is a 750 seat sanctuary plus meeting rooms, offices and a large fellowship area. The picture at the top of this email is an artist’s representation of the new addition attached to our existing building plus the lighthouse! Pastor Chris shared a story about the inspiration for the lighthouse with the illuminated crosses on each side. It is our desire to communicate with this tower of hope that all can come to the cross for help. The crowd was treated to a virtual tour of the new building which is available to you on the link below. You will also find the floor plan and site plan to help you understand more of the details of our plans. The full video of the Friday Celebration is available for your viewing. Chris Atkins’ concert is at the beginning and Pastor Holck’s address begins at the 49:30 mark. 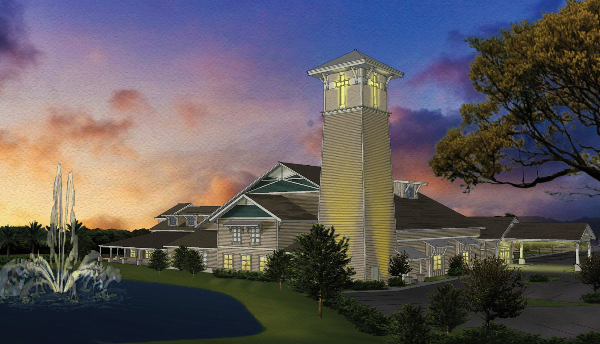 The celebration event marked the beginning of the Living Oaks Campaign, a three year initiative to raise $7.5 million dollars to build the new sanctuary and purchase a second campus in the southern part of The Villages. No offering was taken, but rather, all who attended and those reading this email are asked to pray about what they would like to give over the next three years to help this vision become a reality. On April 7, we will gather once again as one large group at The Grove on Sunday morning and on that day, we will announce the total commitments of the people of Live Oaks. The theme for the Living Oaks Campaign is “Gather to Go.” We need a place to gather; a larger place as we are already running out of space just one and a half years after moving into our Woodridge campus. Our Sunday morning services are quite full so would you consider attending our Saturday or Sunday afternoon services? Or would you consider moving to the front row of chairs? We want to make more room for the visitors who join us every week. We have had over 100 first time visiting families in the first three weeks of this new year. Something else you could do is park in our east parking lot since visitors are not likely to even know it exists. We Gather to Go expresses our desire to move people into ministry outside the walls of our gathering place. We believe that a successful capital campaign will advance the mission of our church and grow the Kingdom of God. Be watching in this Saturday’s Daily Sun for an article about our event and our plans for expansion. The end of the due diligence period arrived and the lawsuit on the adjoining property had not yet been resolved. As a reminder, the lawsuit neither involves the sellers nor us, but it prohibits the completion of the sale. While this was disappointing news, we are pleased to report that the sellers agreed to a 90-day extension to the due diligence period which extends our offer until mid-April. If the lawsuit is not resolved by mid-April, our plan is to ask for an additional extension of time. We also met with leaders from The Villages who continue to be very supportive of our efforts to purchase this property. They re-confirmed their ongoing commitments to LOCC related to the property and to the proposed extension of Buena Vista Blvd. In the event we are not able to purchase this property, The Villages also re-confirmed their willingness to work with us in finding alternative building sites for our southern growth. We are excited by our continued growth and our vision to reach our growing mission field; older adults in, around and beyond The Villages. Please continue to pray. We want what God wants and we trust His timing to be perfect. For Chris Atkins’ concert, view from beginning. If you were unable to attend our Celebration Event but will be in church this weekend, CD’s will be available for sale for $15 in the Commons both on Saturday and Sunday. chrisatkins.net/music or by purchase order form below.